The ultimate goal of SCM is to cultivate the mind in order to achieve the proper balance of mind and body, which will lead to good health and longevity. This is the fundamental concept of this medicine. Constitutional differentiation may appear simple, but it can become complicated if we lose sight of Dr. Lee Je-ma's basic theory. What has been presented thus far regarding physical shape, mental nature anddisease syndromes describes the typical paradigm of each constitution. However, you are not likely to see a patient with a fixed mental state or one with a unique disease syndrome. Therefore, it is best to combine the three methods of analysis (physical shape, mental nature and disease syndromes) when possible. Each method has its own limitations and exceptions for constitutional differentiation. 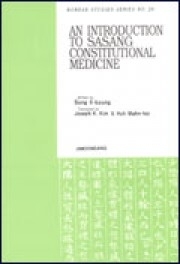 SCM theory formed by Lee Je-ma is totally different from the Western Medicine. SCM cures people’s hurt body through cultivating the mind to achieve the proper balance of mind and body. This book gives readers brief and clear introduction of the basic concepts of SCM. 사상체질의학의 최종 목적은 신체와 정신이 조화를 이루어 궁극적으로 정신을 풍요롭게 하는 데 있다. 이것은 인간의 건강을 유지시켜 주며 장수할 수 있게 해준다. 이것이 사상체질의학의 근본적인 발상이다. 체질의 차이는 간단해 보이지만 이제마의 기본 이론을 알지 못한다면 아주 복잡한 것이 될 것이다. 사람의 체형과 천성과 질병으로 파악되는 체질은 각 체질의 전형으로 드러난다. 그러나 한 사람이 한 체질의 유형으로 고정되어 있다든가 그 체질에 해당하는 질병만을 앓게 된다고 볼 수는 없다. 그러므로 가능하면 3가지 방법의 분석(체형, 본성, 질병증후)을 혼합하여 몸의 상태를 파악하고 분석하는 것이 가장 좋다. 각 방법은 각각의 한계와 체질에 따른 예외가 있다.